“There is a red thread that connects all those who shall eventually meet…” is the wonderful message of the Red Thread community, a loose collective of women bound together through Intentional Creativity, anchored in the pioneering work of West Coast artist Shiloh Sophia McCloud. Sometimes, we get a little hint ahead of time—a little glimmer of a reminder days, months or even years before we pick up the phone and make the connection! When something is important, our body lets us know. I feel chills up and down my spine. “Pay Attention!” my heart commands. One day, in an airport bathroom, I had observed this visceral sensation of knowing and asked myself, “Am I part of the Mary Magdalene lineage?” I remember seeing the Da Vinci Code movie, having no idea who Mary was. Years later, when I perceived Magdalene in a painting by Shiloh Sophia, it was the chills that clued me in. I understood, on a deep level, that this image was of great historical importance to my lineage, that it was a golden key for the soul of the collective divine feminine. And that it was embedded in my cellular memory. I began to see Shiloh-style paintings by my female friends popping up on my Facebook feed. I followed workshops they attended and became curious about the community materializing before my eyes. It was as if these women grew their wings of self-expression, they had graciously incorporated a whimsical muse into their lives. Meanwhile, Shiloh’s students’ paintings began showing up at all the Goddess events I sang at as a vocal performer. Busy with my own vocal work, teaching and vibrational healing, I watched from the periphery for many years. Inviting Shiloh to speak at my SOAR Women’s Circles brought me a bit closer into her magical fold, and later on, I invited her to lunch to explore her world viewpoint. Touring Shiloh’s Healdsburg, California studio, I perceived the world of art-making that was uniquely hers, swirling and alive with the energy of women’s empowerment, an astounding generosity of spirit, and a marvelous inclusiveness. We can credit Shiloh with lifting up a whole generation of women. In a modern era of great societal upheaval within the realms of gender, sexuality, religion, race and the sacred, she is a true role model — a contemporary Renaissance woman. Never boring, Shiloh is humorous, articulate, and a leader giving women permission to BE BIG. In her image, I found a stunning mirror of my Divine Feminine Voice work BE the LIGHT, a modality which coaches women to SOAR (Sounding Our Authentic Resonances) and speak up. Around the time I met Shiloh, I felt I had done most of my life’s bucket list and was moving towards semi-retirement. In 2017, I made a decision to embrace painting in the lineage of the Red Thread. Part of me was afraid my self-image as a non-artist would block me from having any success. Fortunately, the inquisitive, exploratory gypsy in me won out. I envisioned painting for the rest of my life as a quiet and contemplative spiritual experience. I committed. I joined the Intentional Creativity Painting movement with Shiloh Sophia McCloud, enrolling in the 2018 Color of Women Program. Soon, I was sailing through the steps, painting and drawing so voraciously that I wondered, What did I do before Art? The assignments allowed me to go deeply and honestly into my own processes and SEE the movement of the energetic fields. 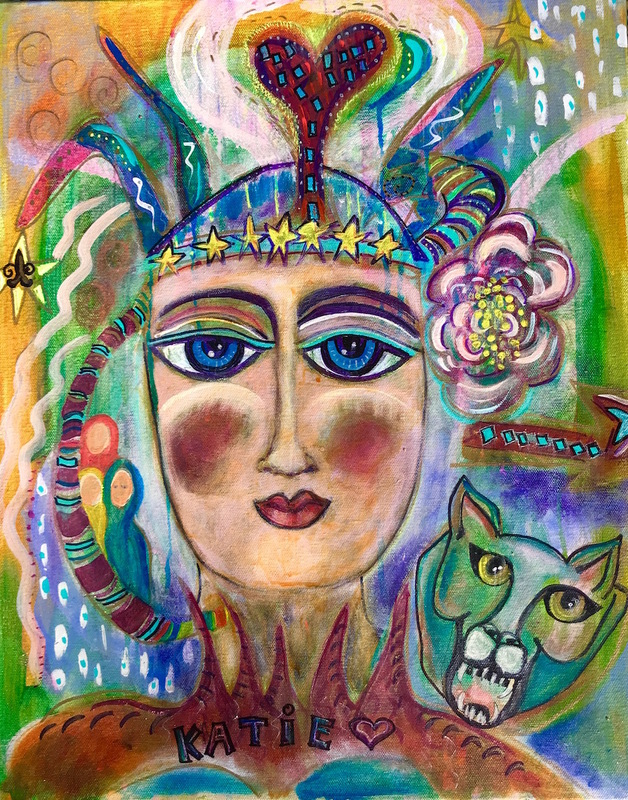 I began to paint other people, my children and friends, and observed the positive shifts that occurred in their lives. Eventually, I decided to offer Soul Portraits to the world. People love them. Far into the program, I began to fully understand why the Intentional Method of Creativity works so well for me. It MARRIES the Be the Light INTENTIONAL invisible healing work I developed over the years with creativity. The paintings are a profound visualization of healing and bring an element of visibility, allowing people to SEE the movement of energy through color and form. To my surprise, Art strengthened my previous work by adding a crucial visual element: allowing my clients to SEE how intention is expressed through color. Looking back, I see the that the experience of chills clued me in to an augment for my progressive healing practice. 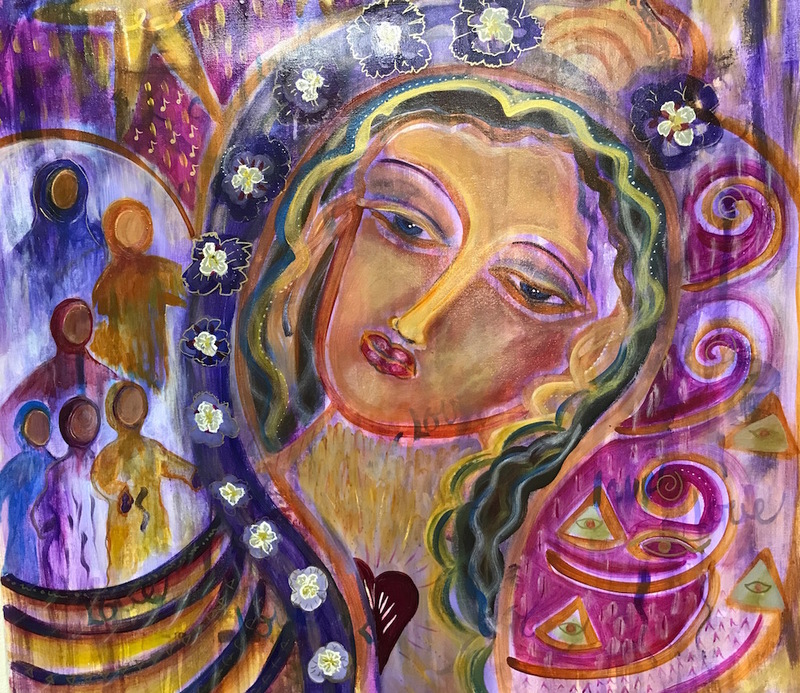 Each painting is lovingly held within the “Red Thread Community,” a colorful, inspired group of women who connect on the web and in Shiloh’s workshops, training sessions and classes worldwide. The Red Thread can be thought of as the “bloodline” of the feminine divine DNA carried through the Mary Magdalene lineage, spreading out across the globe and now awakening us as we re-gain our remembrance of our true heritage, and the Feminine face of our creator. During every gathering of the Red Thread Community, attendees carefully send a ball of red thread around the room. 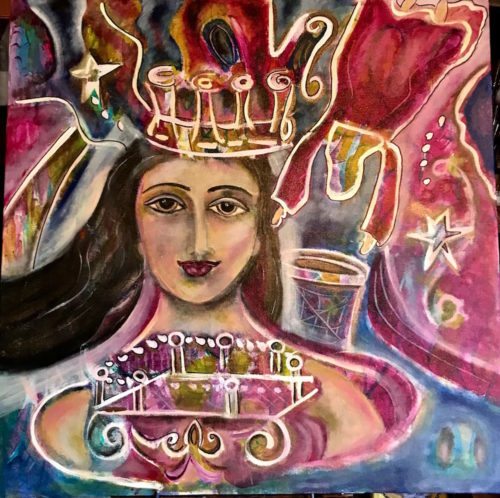 Magic explodes as we remember our divine connectedness to the wisdom of the feminine in sacred circle. “What are you here to cause and create?” asks Shiloh Sophia, urging us to reclaim our power, to expand spiritually and embrace possibility. Why is the Intentional Creativity, or IC method of Painting so profound? It stems from a long lineage of women honoring the truth of and living through the lens of art in community. The Red Thread lineage was sparked in the 1940s by Lenore Thomas Strauss, who affirmed the power of creating art through intention and acute sensory awareness. Sue Soya Sellers, given the gift of Lenore’s profound philosophies, took her cues from nature as she would go on to become Shiloh’s significant mentor. 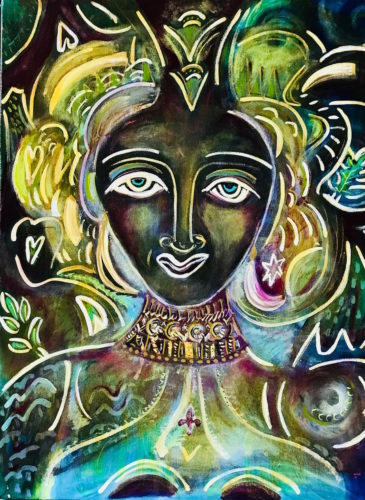 Shiloh, a fiery young creative born of a bohemian artist community, became the third woman to carry the torch of this lineage at a young age. She thrived in the honest environment of life inquiry through artful living with her mother Caron McCloud. 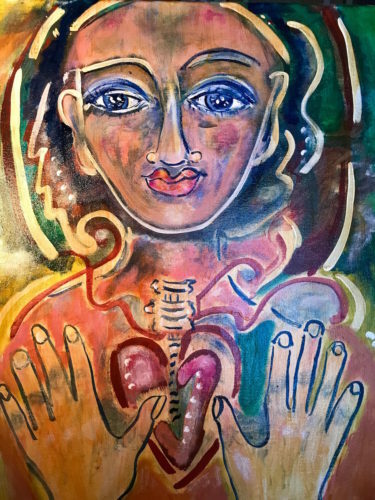 As Shiloh came of age, she began to sense it was her mission to carry on the Art processes for Healing. She stepped forward with courage and flair, and she gives us all hope we can be artists—even if we feel we aren’t “real artists.” Art is healing and not reserved to any domain or group. 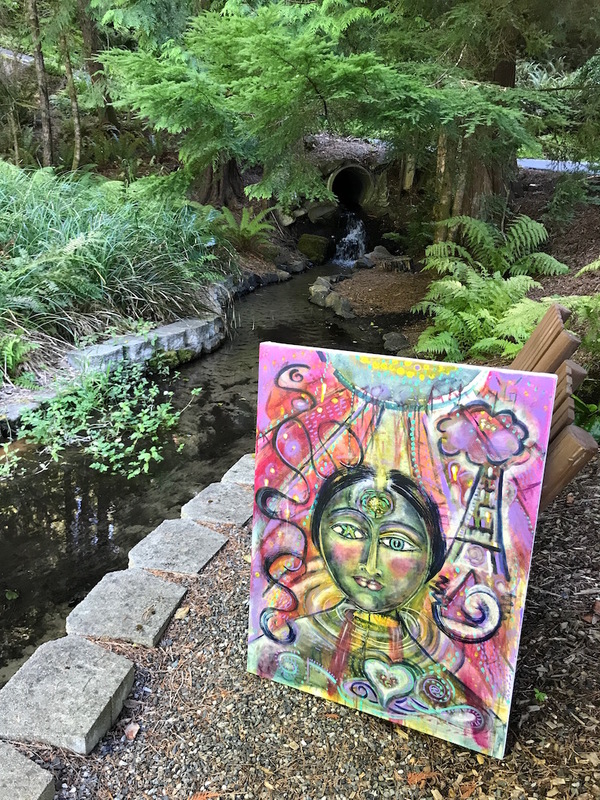 Shiloh teaches us Art heals, in that it takes us back to our natural state and shows us what is out of balance, revealing one brush stroke at a time how we can gracefully detach from misalignments, such as those that stem from our convoluted, fear-based society. She radiates the Feminine principles of: Resilience …Empowerment…Connection…. Leadership. (her words). She is an eloquent wordsmith, bridging the esoteric and practical. Women resonate with her fun hats, vibrant clothing and unapologetic presence. Shiloh’s work is nothing short of a MOVEMENT. As a result, Shiloh attracts women worldwide to get a hold of that red thread. 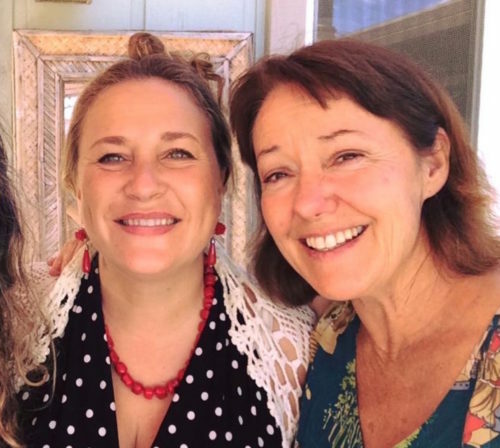 Because of Shiloh, the IC method is practiced in homes, hospitals, shelters, classrooms and at the kitchen tables of awakening women everywhere. Eileen Nash, a TV host on my Women Helping Women SOAR Channel, exemplifies the self-awareness and dedication needed to make profound art. 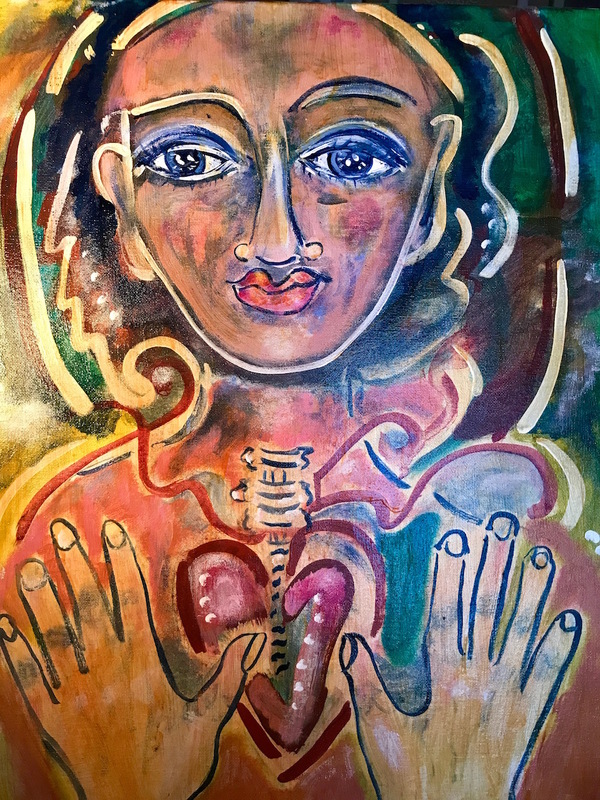 Painting in her early morning “café,” Nash re-aligns the particles of life not only for herself, but all those her life touches—as a mother, muse, nurse and educator. 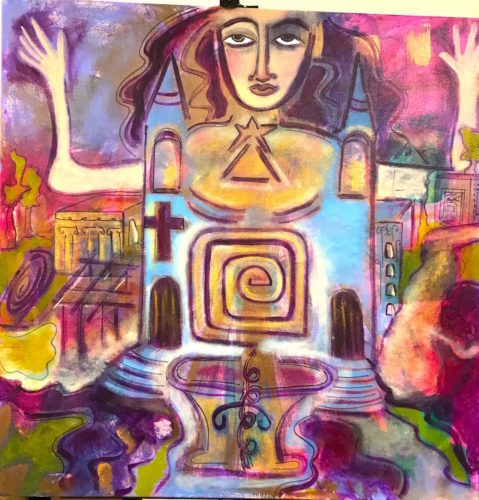 Katie Ketchum’s paintings grace the walls of her Church in San Francisco where she sings and leads congregations energetically alongside heavenly images celebrating the beauty of the Feminine spirit. These Red Thread women shine forth with hope and goodness. 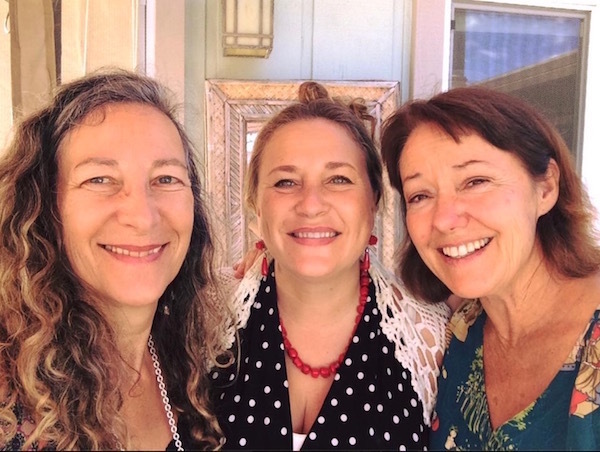 Over the years, Shiloh has continually fine-tuned her method and birthed important structural aspects which organize and hold our growing community of Cosmic Cowgirls. Her “Color of Women” training brings together awakening women with the intention to create, while healing through paint and claim a sense of belonging within the larger circle of the Red Thread. Her work is a planetary blessing of enormous ramifications. Shiloh’s books, cards and trainings all flow naturally, like a brook to a parched world. 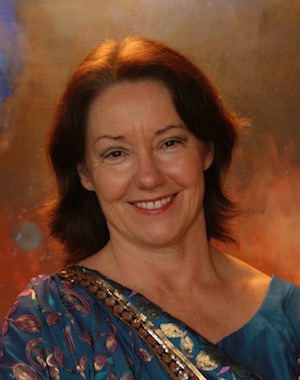 Her free IC videos make the work accessible to many more, indicating what a generous heart and dedication to the spirit of her mission she holds. In 2015, the same year Shiloh spoke to the United Nations, a nonprofit was formed called the Intentional Creativity Foundation. Its foundational pillars are: Enduring Influence + Curating Culture + Global Movement = Intentional Creativity. 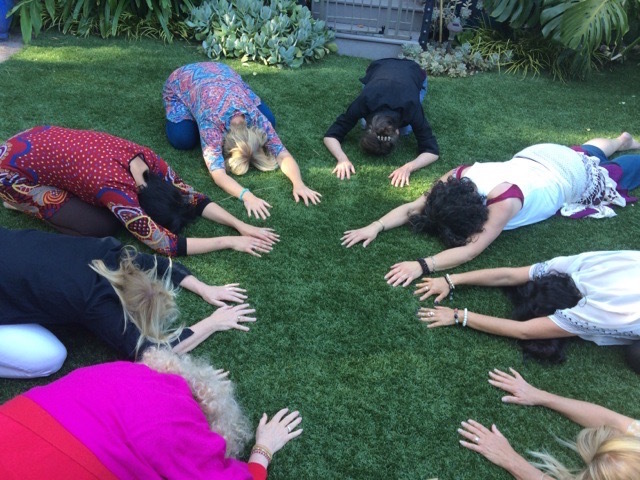 Shiloh delivers her work powerfully to the world through both virtual programming and in-person gatherings. The women she attracts seek clarity, healing and empowerment in their lives. The Red Thread continually grows as Shiloh guides each one of us to make this practice our own, without posturing or competition. Shiloh is an exemplary woman in my personal opinion, as she is fully awakening the voices of women who have long sought an outlet for their inner sense that there is something profound they have to bring to the world. The Red Thread community and Intentional Creativity offers a creative ritual to release traumas, a space to blossom as artists, and a simple, sustainable business model in which one can offer these teachings to the world. It’s a true blessing and one that is ultimately so very much needed to mobilize the masses of women who are pioneers in the paradigm-shift leading humanity back to the core Divine Feminine ideals of loving community. Since presenting her work to the UN, Shiloh is a sought after public-speaker globally. 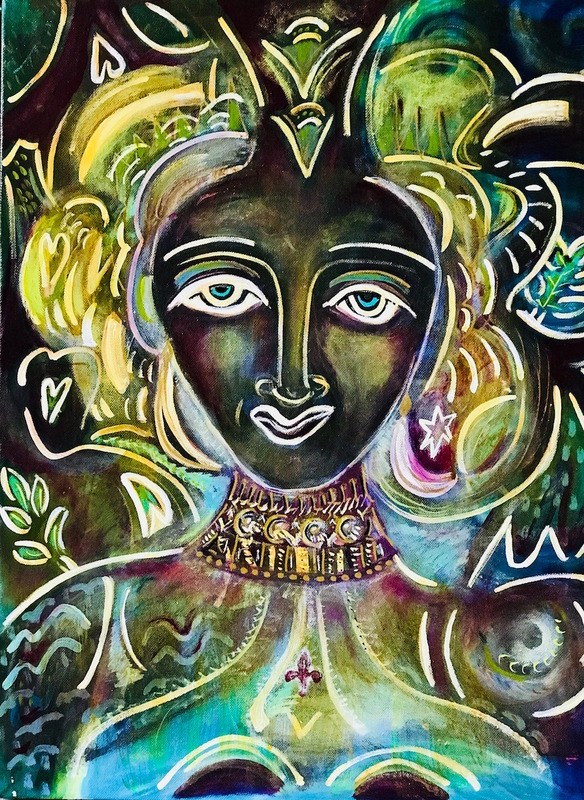 You can find her leading Guild Workshops in Italy, France, and wherever women circle up and get connected to their divinity through the Arts. Shiloh Sophia McCloud is truly the perfect example of the type of woman I often featured on my Just Jan TV show, a media platform championing where kitchen-table wisdom goes viral onto the larger tables—of leadership and authority. Long live Shiloh Sophia. And all the initiates that became and are becoming ambassadors of TRUTH through art. Bless them all. "Our Lady of Heart Healing Mary"
"Queen of Healing the Fall"